The Chocolate of Meats: Carnish Culture: BabyCakes Gives Birth - Again! Carnish Culture: BabyCakes Gives Birth - Again! If you've EVER followed my blog for more than like a second then you know that I'm a faithful lover of NYC-native vegan and gluten-free bakery BabyCakes. And Erin McKenna, the sweetheart behind the delicious operation has been keeping mighty busy. She's opened outposts in downtown Los Angeles and Downtown Disney at the Walt Disney World Resort Florida, released an acclaimed cookbook (check out the Sweet Paradise Cake! ), and now already a second book, in stores today. 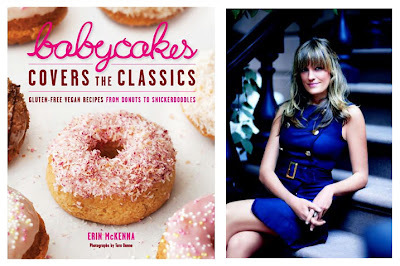 The new edition, dubbed "BabyCakes Covers the Classics: Gluten-Free Vegan Recipes from Donuts to Snickerdoodles" contains 50 dietarily-reinterpreted recipes for favorite treats like Thin Mints, whoopie pies, waffles, pancakes, hamentashen, sugar cookies, German chocolate cake, donuts, Mounds, and madeleines... Finally, sweets for all! BabyCakes Covers the Classics: From Donuts to Snickerdoodles. It's the New Cookbook!!! from BabyCakes NYC on Vimeo. Preview vid shot & directed by David Mettler, produced by David Mettler and Chris Cechin, and edited by Justin Gallaher.